After a week of heavy but badly needed rain the sun has finally come out. The drought ending moisture and the rising temperatures in the high 20s have caused the various shrubs and trees to start leafing out. Spring has arrived but some of the Mexican birds like the Whistling Ducks have not yet come back to their northern limits here in Texas. That should take place in a couple of weeks or so. This week I am featuring a permanent resident that occurs north of Mexico only in this southern tip of Texas. The Buff Bellied Hummingbird is common around here and a hummingbird feeder will easily attract several birds. It is the only hummer that is regularly seen here save for the Rufous and Ruby Throats that pass through here during spring migration as they head north as far as Canada. There are a few more rare strays from Mexico that show up here occasionally but I have not seen any of them yet. Compared to the Ruby Throat found on the Canadian prairies the Buff Bellied is quite a bit larger but not so much that it is noticeable In the field. 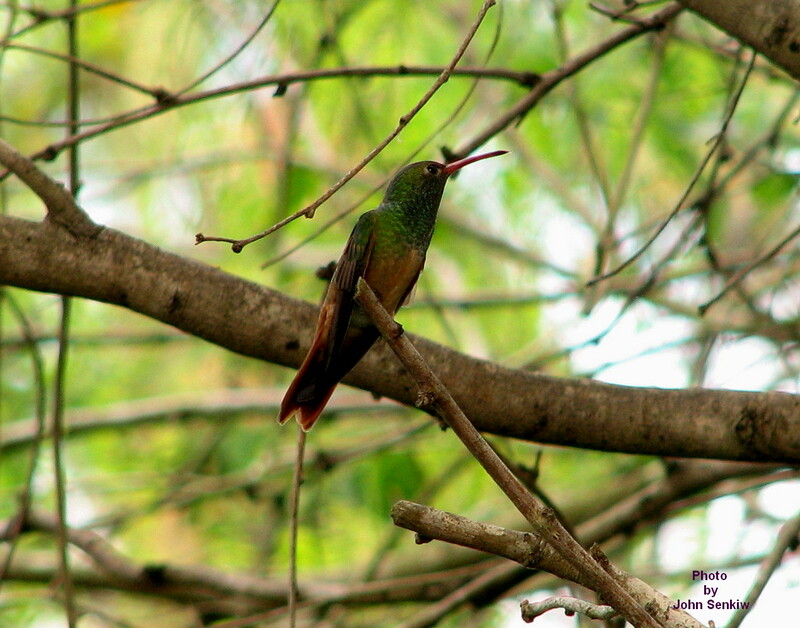 What is different are the males’ throat feathers (gorget). The Buff Bellied has a bright green throat while the Ruby Throated had a deep red (ruby) one. In good light both gorgets sparkle with their respective colours. Another difference is the shape and colour of the bills. The Buff Bellied has a down curved red bill tipped with black; the Ruby Throat has a straight black bill. 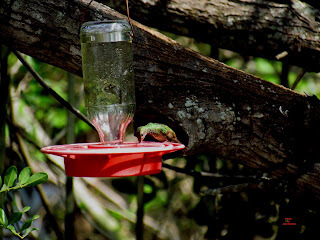 Like many hummers both are essentially green with the above noted differences. 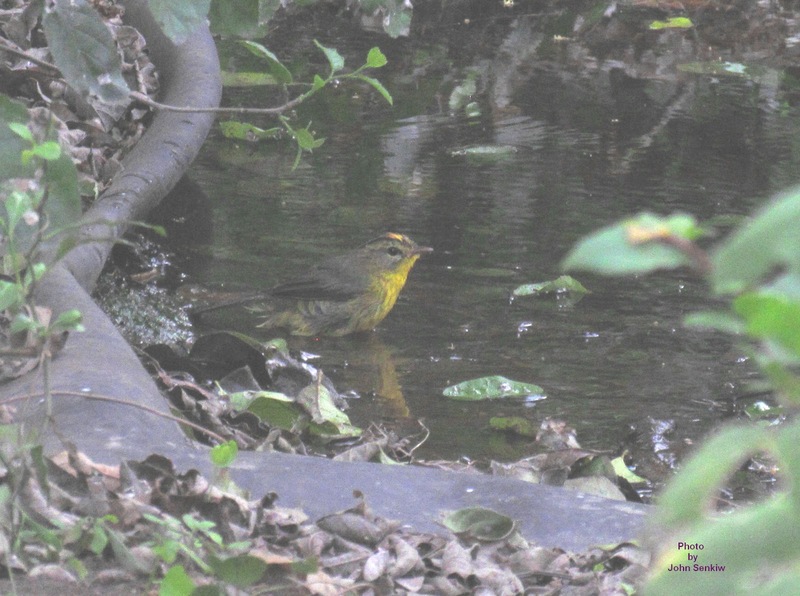 This week’s picture was taken several years ago in the Frontera Audubon thicket just above a water feature. The field marks noted above are not clearly shown but I hope to have a better picture on my website in the near future. Jan. 3rd, 2013: including a photo of a male sitting in a tree. 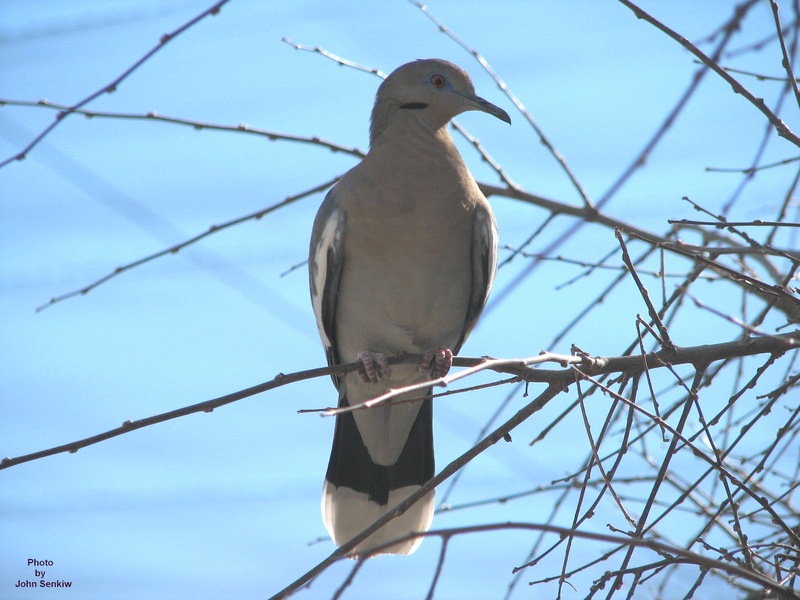 When we arrived down here one of the first things we did was go for a bird walk in the Frontera Audubon thicket to see two rare Mexican birds that were reportedly there. One was the Crimson Collared Grosbeak; the second was the Golden Crowned Warbler. The grosbeak had not been seen since the middle of January but the warbler was being seen daily. After two trips into the thicket and a lot of patience we got to see this rare tropical warbler which was another “lifer’ for us. 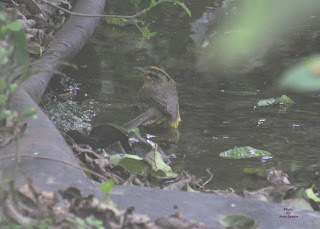 It is a rather nondescript dark greenish bird with yellowish under parts (much like the Orange Crowned warbler) and a gold (yellow) crown patch bordered by black. Not seeing the grosbeak was not a real disappointment as we saw it two years ago in the very same thicket but would have liked to have seen it again. The Crimson Collared Grosbeak is halfway between a sparrow and robin in size. At a glance it looks all black but upon closer examination the other colours become evident. What I found really unusual about this bird is the difference between the female and male. With most birds, where the sexes are different, the females are simply washed out versions of the males. Not so with the Crimson Collared Grosbeak. Here the sexes are just different. The male is black with deep, dull red shoulders and breast; like the male, the female is also black but the red is replaced by a deep, dull green. They look more like different species rather than males and females of the same species. Like all grosbeaks they have massive seed cracking beaks with jaw muscles to match. The staple food of the Crimson Collared Grosbeak is the fruit of the Potato Tree. The Potato Tree tree is not related to the potato plant but is so named because of its resemblance to it. This lilac bush-size evergreen has soft velvety leaves and cherry sized green berries just like a regular potato plant hence its name. The Potato Tree is common around here and can be found in almost any mature thicket. As of this writing I have not been able to get a picture of the warbler but I am still trying. The photo of the green female grosbeak was taken two years ago when we last saw it. Since the newspapers carry only black and white photos the colours will only be seen on my web site: www.johnthebirder.com. We have seen and photographed the Golden Crowned Warbler and have included the less than perfect pictures. This is our sixth time in southern Texas and we have come to look forward to seeing the common birds down here much as we like to see our regular visitors when we return home. The only difference is in the species. Rather than the Chickadees, Robins, House Wrens, Ruby Throated Hummingbirds back home, down here we have the likes of Chachalacas, Kiskadees, Altimira Orioles and Buff Bellied Hummingbirds just to name a few. What is unique is that the birds just listed are Mexican crossovers that barely make it into the USA but, nevertheless, are common down here. Some like the Great Tailed Grackle, Black Crested Titmouse and the Mockingbird are more widespread in the southern part of the US but are not found in the Canadian Prairies. Others like the Orange Crowned Warbler are winter visitors that move north for the summer to nest in the Boreal Forest. Finally, there is the ever present House Sparrow which always reminds us of home. 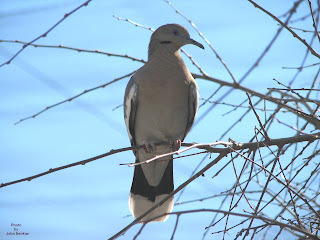 In this article I am covering a bird that is not found in our yard here in Texas but is quite common in rural areas. 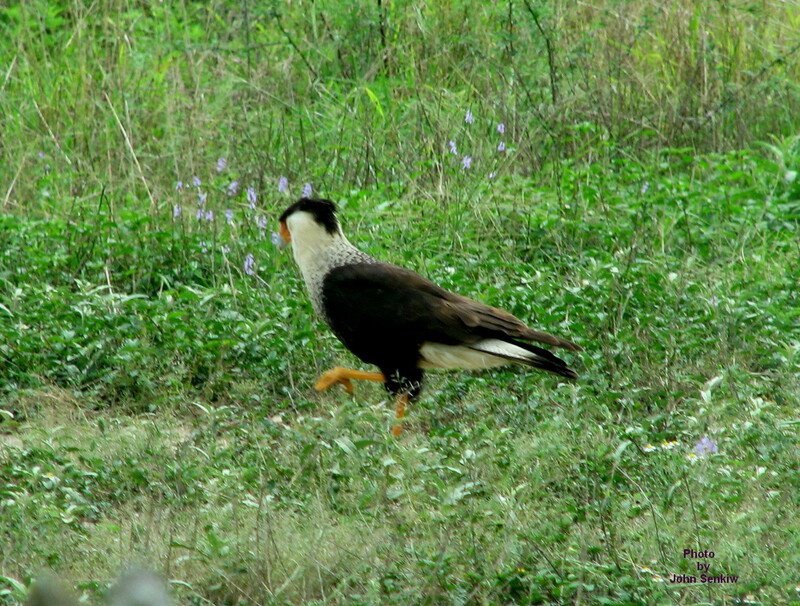 The Crested Caracara, a relative of the falcons, is primarily a carrion feeder that will occasionally take grasshoppers and small rodents. Although a member of the hawk family its slow flight, weak legs and feet make it incapable of taking larger prey. For a falcon the Crested Caracara is rather large approaching a raven in size. Its white neck and tail cause it to be occasionally mistaken for a Bald Eagle, but the caracara’s black crown and crest easily separate the two. In flight it appears all black with white head, tail and wing tips making identification easy. To some early devout Christians the bird was very special because it reminded them of a dark cross with white tips on all four points. 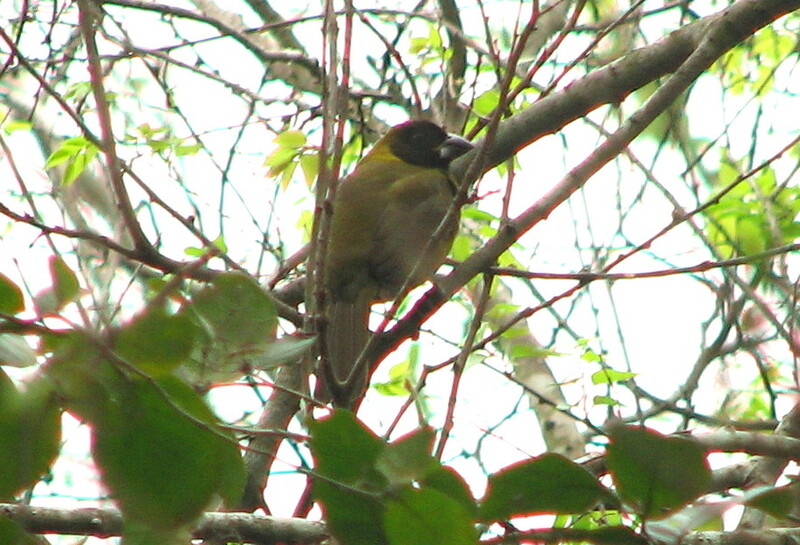 The yellow beak is massive and can be seen with the naked eye whether the bird is perched or in flight. Males and females are the same. Caracaras are strictly new world birds with only the Crested Caracara found north of Mexico. When Mexico became independent the authorities of the new nation decided to adopt a national bird emblem. According to various sources, it was decided to adopt the same bird that was the emblem of the Aztec Empire but nobody was sure what it was. Eventually, it was determined that the bird emblem of the Aztecs was the Golden Eagle so this particular raptor was adopted as the state bird of Mexico in much the same way as the Bald Eagle of the US was chosen. Since then it has been determined that the bird emblem of the Aztecs was actually the Crested Caracara and not the Golden Eagle as first thought. This has led to some confusion and some debate as well. Many Mexicans would like to see the Crested Caracara made the state bird rather than the Golden Eagle. Locally, the caracara is often referred to as the “Mexican Eagle” and is often thought to be the state bird of Mexico. This week’s photo was taken off a moving jitney when we were on tour at the famous King Ranch in southern Texas. There were actually a pair of caracaras collecting nesting material but I managed to get a picture of only one of them. 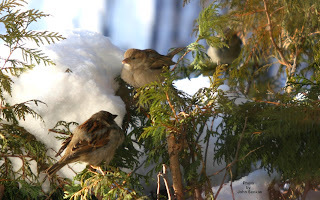 "John Senkiw", "Foam Lake Review", "Kamsack Times"
I am always amazed at how well our winter birds manage to survive the kind of severe weather that we have been having recently. Watching the birds at the feeders in -32F temperatures while having my morning coffee makes it seem not quite so cold outside. The regulars are still with us with the pleasant addition of large numbers of Redpolls that have been absent the past two years. They can certainly clean out the Canola feeders in a hurry. In last week's article I had mentioned that I had never seen a Robin in the winter time. 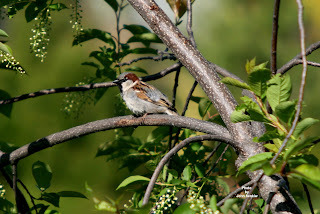 Well, since then my wife and I spotted one in a Poplar tree in our backyard providing us with a new birding experience. I ran for my camera to get a photo of it but by the time I got back the Robin had flown away. Too bad. To me one of the most interesting birds is the ubiquitous House Sparrow. What has impressed me the most is its adaptability. It manages to do whatever it takes to not only survive, but to thrive in changing conditions. It should be noted that the House Sparrow is not really a sparrow but a member of an old world family of birds called Weaver Finches. Another member of the family, the similar Eurasian Tree Sparrow, has been introduced with limited success. A small colony still exists near St. Louis, MO. As mentioned in Article No. 131 House Sparrows were brought to the Americas in the 1800s to "augment" the native bird population. The first few introduction attempts failed but enough birds were brought over that eventually success was achieved. Then, the Sparrows adapted so well and reproduced so quickly that within several decades a bounty was offered in an attempt to exterminate them. Those and future attempts to eradicate the species failed and now the House Sparrow is here to stay. All sorts of horror stories were circulated about the aggressiveness and destructiveness of the House Sparrow and while true to some extent were greatly exaggerated. How so? Well, the House Sparrow is aggressive but it lives only in the proximity of man where very few other birds do. This means that there is no real competition for food or nesting sites except in the vicinity of man. Sparrows prefer to nest in birdhouses and will at times expel other birds such as Tree Swallows and Blue Birds. If the nest boxes are situated away from farm buildings and urban centres the sparrows will stay away from them. On the other hand, sparrows will share multiple room Purple Martin birdhouses with the martins and with other sparrows. Birdhouses for House Wrens are just too small. If no birdhouses are available sparrows will build nests under eaves troughs, thatched roofs if available, street light fixtures and so on. If none of these cavity type sites are available they will build a free standing nest in a tree preferably spruce or Pincherry. The nest is an unkempt volleyball-sized ball of grass and feathers with an entrance hole in the side. I know of no other bird that is that flexible in its nesting practices. Not only is the sparrow flexible in its nesting habits but it is just as flexible in its diet. It is primarily a seed eater, even shelling sunflower seeds for the oil, but will eat many other things as well. Along with the woodpeckers and chickadees sparrows gorge themselves on peanut butter and fat mixtures in our feeders. In the summertime they can often be seen feeding on squashed insects on the grills of cars and trucks. Easy pickings. In the spring they will feed voraciously on newly sprouted peas. It is comical watching sparrows lined up along a row of peas and tugging at the fresh pea leaves. As they tug at the leaves they brace themselves in an upright position ending up tumbling head over heels backwards as the leaf finally tears. The humour ends when the peas are stripped bare resulting in a row of dead plants. In the last several decades the House sparrow population has declined locally and in Europe it has declined drastically. Why? When horses were the only means of transportation there was horse manure everywhere. (Old timers should remember those days). Unlike cattle horses do not have a very efficient digestive system and many particles of grain pass through their digestive systems and end up in the streets in manure. Although disgusting to humans, sparrows thrived on the partially digested grain in the manure. With the replacement of horsepower with machinery and the reduction in the number of farms and subsequent reduction in livestock the sparrow population has declined. This week's photos are of sparrows sunning themselves, the male in the morning and the group in the afternoon just outside our window.